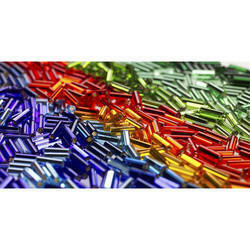 We are offering Glass Bugle Bead they are long tubular glass beads available in different length size. Our product range includes a wide range of Colored Seed Bead such as Transparent Color Bead, Seed Beads, Transparent Rainbow Bead, Transparent Luster Bead and Silver Line Beads. Quality seed beads from Miyuki and Matsuno in Japan and Preciosa Ornela in Czech Republic. The range includes delicas, tila beads, twin beads, farfalle beads and bugles. - Product Details:-The color of the beads is black gold but it still has a pearl like finish, which gives a little shine to the beads.